I was looking through old photos and found these photos from the Summer which I never shared. 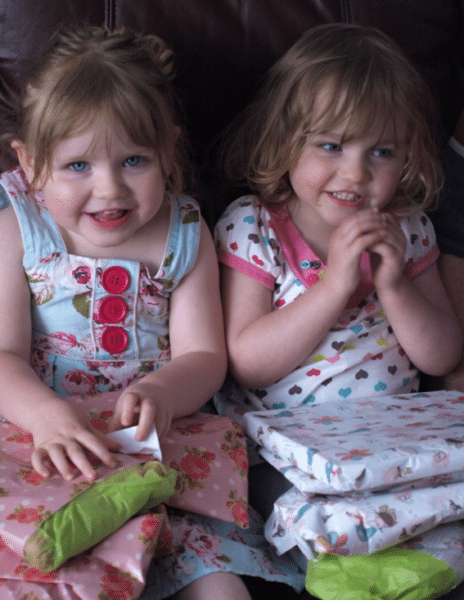 The twins had just had their 3rd birthday and I wanted them to make some Thank You cards for their presents. They loved drawing but couldn’t write anything and their pictures didn’t have any forms. 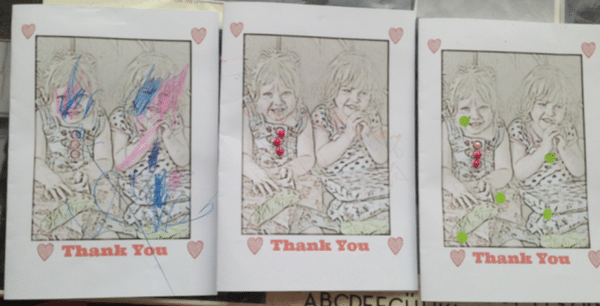 So I had this idea to make them Thank You cards which they could colour in. 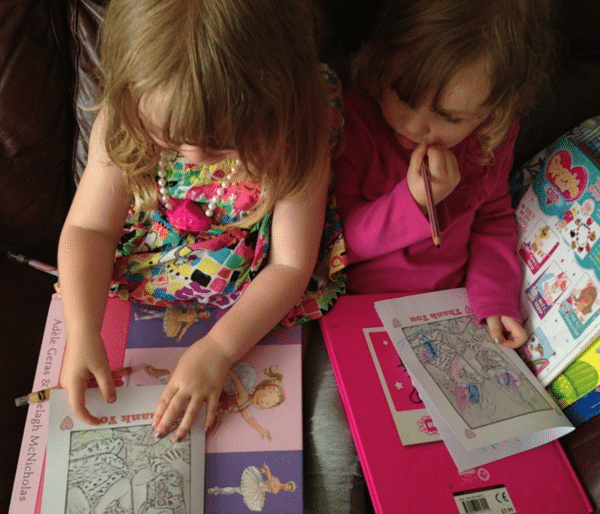 I have often made them colouring books using photos of themselves and other family members. 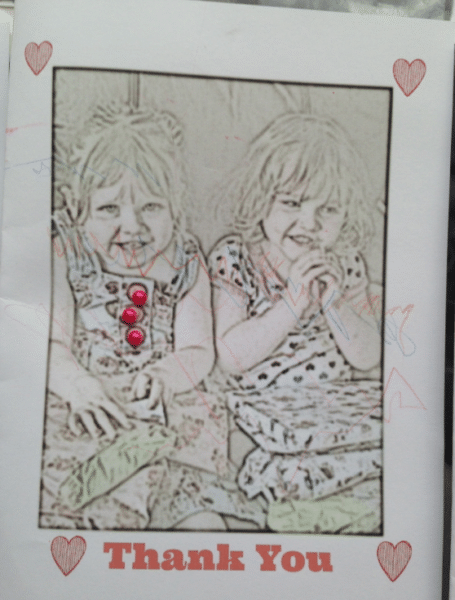 They are easy to make – you just need a sketching photo app. The one I have on my phone at the moment is called Sketch Me! and is free but there are loads of other ones. All you have to do is upload you picture and choose which sketch looks the best. I chose one of the twins with their presents. Once I had a sketch I put the picture into photo editing website. My absolute favourite is Picmonky and added a border and the words Thank You. You could just do these with stickers or write with pretty handwriting. 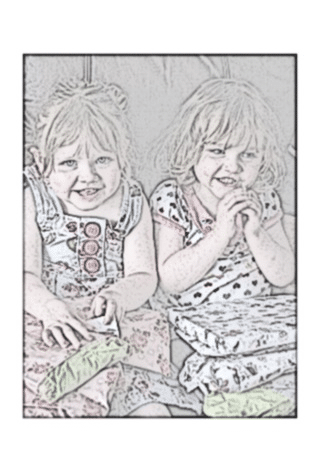 Then I let the twins lose to colour it in. They really loved doing this and stuck on lots of sequins too to give it a bit of sparkle. The end result was a really pretty set of cards totally personalised for each person. they would be great as Mother’s day Cards or birthday cards with a picture of the receiver and the children together. I’m definitely going to make some more with the girls now they are a bit older and their colouring is a bit better. The end results. As you can see there is a varying degree of accuracy but that adds to the charm! I’m not sure why one of them is covered with green spots. I made some for Molly too but she didn’t like my idea at all and instead wanted to make some using her flower press. We made these pressed flower thank you cards instead.